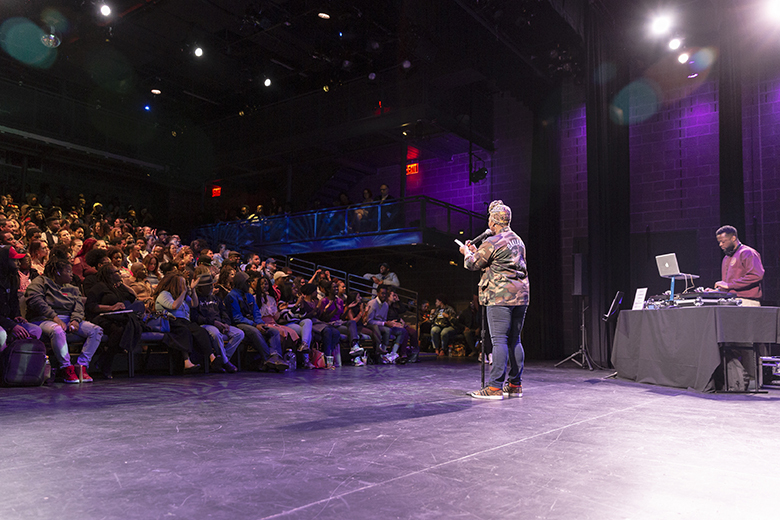 Brooklyn’s best slam poets gather for a night of words, wisdom, hosted by poet, activist, and educator Mahogany L. Browne and DJ Jive Poetic. This event is General Admission Seated and will be on the BRIC House Stoop. This event is first come, first admitted, as space is limited. Mahogany L. Browne is a Cave Canem, Poets House, and Serenbe Focus Fellow alum, and the author of several books including Swag & Dear Twitter: Love Letters Hashed Out On-line, recommended by Small Press Distribution & listed as About.com Best Poetry Books of 2010.She has released five LPs and is co-founder of Brooklyn Slam (currently ranked 2nd in the world) and has toured Germany, Amsterdam, England, Canada, and Australia as one-third of the cultural arts exchange project Global Poetics. Her journalism work has been published in magazines Uptown, KING, XXL, The Source, Canada’s The Word and UK’s MOBO. Her poetry has been published in literary journals Pluck, Manhattanville Review, Muzzle, Union Station Mag, Literary Bohemian, Bestiary Brown Girl Love, and Up The Staircase. She is the Artistic Director of Urban Word NYC (as seen on HBO’s Brave New Voices) and facilitates performance poetry and writing workshops throughout the country. She is the publisher of Penmanship Books, curator & Friday Night Slam host at Nuyorican Poets Café, and Program Director of BLM at Pratt Institute. Jive Poetic is a poet, activist, and educator. He is the Brooklyn Poetry Slam’s co-founder & resident DJ, and has represented the U.S. national slam team, been featured on TV One’s Lexus Verses and Flow, and PBS’ Brief but Spectacular. He teaches hip hop and poetry workshops throughout the country, and is a recent graduate of the MFA Writing & Activism Program at Pratt Institute. In addition to the Brooklyn Poetry Slam, Jive Poetic hosts the Wednesday night Poetry Slam Open at the Nuyorican Poets Café.